Make sure you warm up that stethoscope, because Dr. Giggles is the Greatest Movie EVER! Click on the movie poster or the title above to download our review of the film, featuring Tom ‘Internet Terrorist’ Pandich and Kristina ‘ChibiUFO’ Foster. Review in a Nutshell: Dr. Giggles is a strange film. 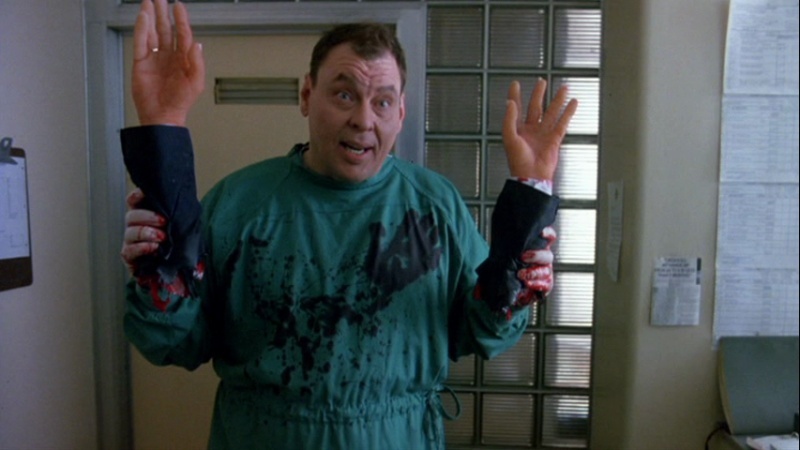 Ostensibly a horror movie, Larry Drake plays the titular slasher-villain like a live-action cartoon, while the rest of the cast is mostly dramatically serious in their roles. The contrast is jarring, and although I appreciate terrible puns as much as the next person, the movie never quite strikes the proper balance between horror and humor. Yes, this scene is accompanied by at least one “give me a hand” pun. It’s mandatory. About as average as you can get, and still be a gimmick slasher film.